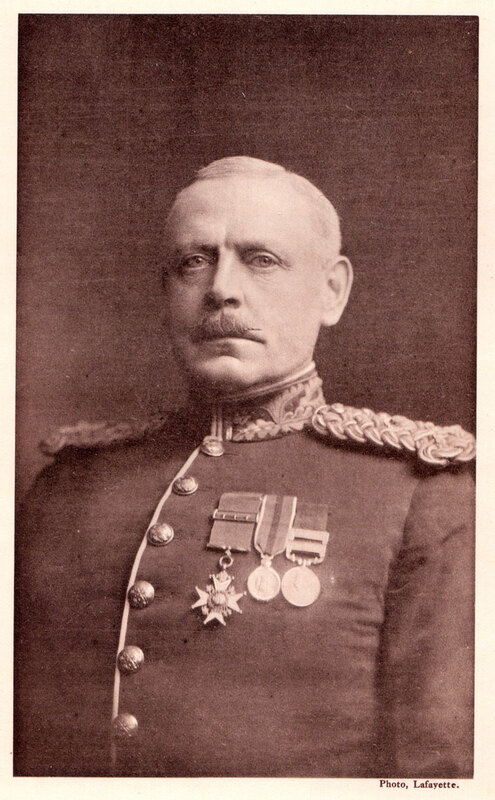 Lieutenant General Sir WILLIAM EDMUND FRANKLYN, K.C.B., p.s.c. Born at Ventnor, Isle of Wight, 14th May, 1856, eldest son of the Revd. Thomas Edmund Franklyn, of Barton Grange, Cheshunt. Sub-Lieut., 13th June, 1874; Lieut., same date; Capt., 30th March, 1881; Major, 20th April, 1886; Lieut.-CoL, 28th July, 1896; Brevet-Col., 20th May, 1898; Col., 29th September, 1898; Major-Gen., 1st April, 1904; Lieut.-Gen., 31st August, 1910; Col, 19th Foot, 2nd October, 1906. Served in the Tirah Expedition of 1897-98, under Sir William Lockhart in command of 2nd Battn. 19th Foot, and was present at the capture of the Sampagha and Arhanga Passes, the reconnaissance of the Saran Sar, operations at and around Dwatoi, operations against the Khani-Khel Chamkanis, operations in the Bazar Valley (Brevet of Colonel mentioned in despatches, medal and two clasps). D.A.A.G., Aldershot, 4th May, 1888—3rd May, 1893; A.A.G., Scotland, 29th September, 1898—8th October, 1899; Asst. Military Secretary, War Office, 9th October, 1899—14th October, 1902. Director of Personal Services, 28th March, 1904—31st May, 1906. Military Secretary to the Secretary of State for War and Secretary of the Selection Board, 6th October, 1911. C.B., August, 1902, K.C.B. King's birthday, 1912. In October, 1914, he was sent on an important and delicate mission to the front. Died at Luton Hoo, Hertford, 27th October, 1914, when in command of the 3rd Army, Central Force. The King and Queen sent the following message of sympathy to Lady Franklyn, " The King and Queen have learnt with much regret of the grievous loss which you have sustained, and I am desired to express their Majesties’ sympathy with you in your sorrow. The King had met Sir William Franklyn quite recently when inspecting a portion of his command." From Queen Alexandra:—" I offer you my most sincere and heartfelt sympathy in the terrible sorrow which has befallen you in the death of your distinguished husband, Sir William Franklyn. His loss will be most deeply felt not only by his regiment of which I am Colonel-in-Chief, but by the whole Army."